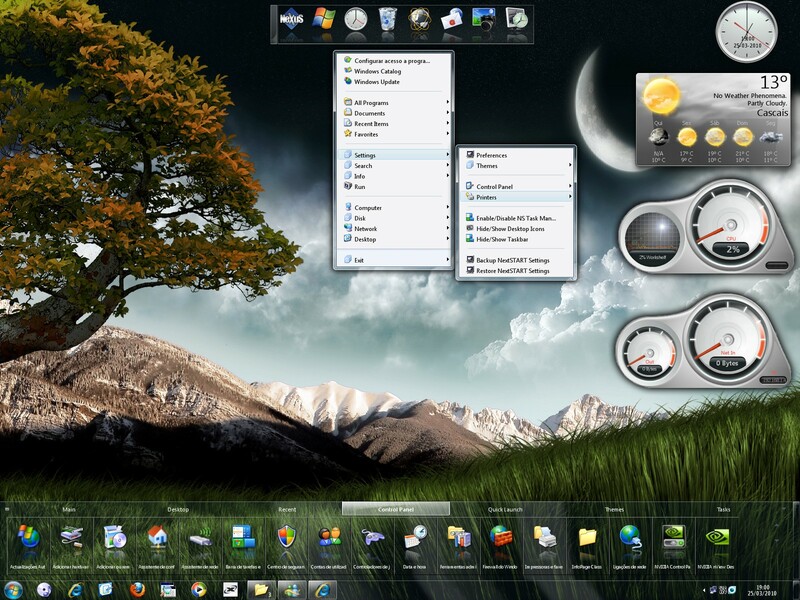 Windows 7 theme for Winstep Xtreme. Original NextSTART Windows 7 theme by Sofonias Assefa aka 'Ceiiular'. It's recommended you use this theme with the latest Winstep Xtreme version, 10.3 or above. Thanks guys! All credit must go to Ceiilular for the original Windows 7 NextSTART theme and nuaHs for the excellent wallpaper. The weather module looks great with the new weather icons (they're Style 2, Stardock ones are Style 1) made by Mark Gisis (aka. Teknofrik). These new icons ship with WSX v10.3 onwards (and so does this theme, actually). The desktop CPU and Net meters use the new 'smooth meters' method, where the needle smoothly accelerates to the new position instead of abruptly jumping there. This is also a new feature in 10.3. If you feel the desktop modules are too big, keep in mind you can always scale them down (right click on the module -> Scale). You can also scale ALL the desktop modules at once by right clicking on any module -> Desktop Modules -> Scale All Modules). The 10.3 release also allows you to hide the system tray control button background so that only the time and date are visible (yes, the systray control button can now display the date as well as the time - keep in mind that enabling both might make your NextSTART taskbar resize automatically to accomodate the new button size). Right clicking on the button is a quick way to access most of the new settings via the context menu. This is just, outright pretty!! As I remember it, Cellular had a file naming problem (all the different colors were named the same) and only NextStart was skinned (the "task bar"). i like the theme in general. the rightclick menu and the startmune should have been made clear as well. how to use this skin???? I noticed that you have the time and date overlayed in your clock. How do you implement this? Provided you are running Winstep Xtreme v10.6, right click on the clock on the system tray and select 'Show Date' from the context menu. Note that this might make your NextSTART taskbar grow automatically to accomodate the new size of the system tray button. what is the bar above the taskbar? I want one.